I have noticed that Singapore Christianity is pretty cutting-edge in terms of harnessing community transformation principles. Years ago, Singapore was used as a prototype for a massive city-taking campaign. The argument went that if you could see the city transformed, then the nation too would be saved given that, in Singapore’s case, the city is the nation. Whilst still a work in progress, an artefact of the campaign is that unity amongst churches is greater than in most other developed nations and the ways the church have sought to engage the marketplace is amongst the most innovative. Last week, after walking around a bit, a group of us went into a cafe for a drink. The cafe was located in the Singapore arts precinct which meant that there were a lot of young people around. The cafe was called Food For Thought. 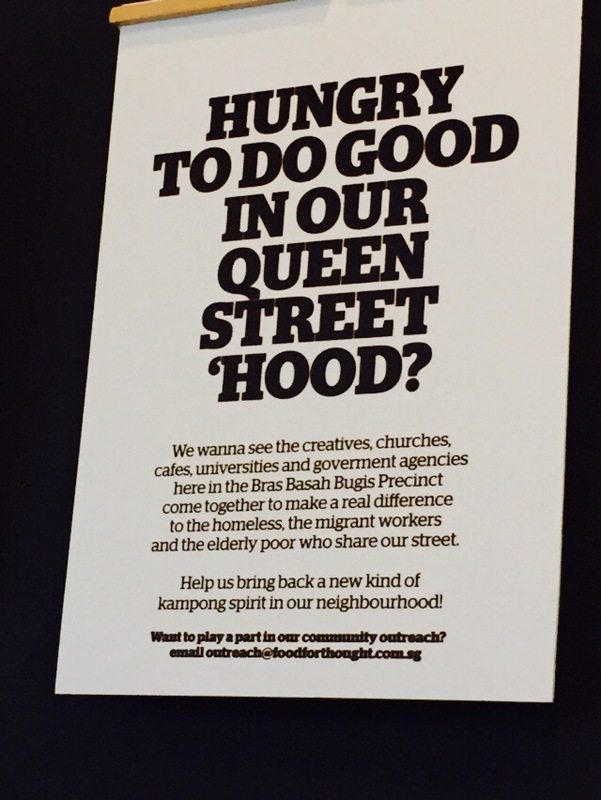 Apparently it was started by a group of young enterprising Christians from different churches with the goal of “transforming community spaces and bringing people together to enjoy Good Food for a Good Cause.” Through the vehicle of the cafe, they try to bring awareness of social justice issues, contribute to various causes, engage cafe-goers into action by education and to inspire change. Everything in the cafe is geared towards its cause. Within 5 minutes of our sitting down and ordering our drinks, the various posters on the wall had already sparked our group into discussing marketplace ministry and how our own church could engage the marketplace in a more meaningful and concerted way. Over the past year, I have become more aligned towards marketplace ministry than ever. For the greater part of my faith journey, I considered worship my primary ministry. But worship must necessarily extend beyond the walls of the church. What better way to do this than through the marketplace? And so I’ve seen God extend my influence not only in my own office but also in my broader profession especially amongst the younger practitioners. 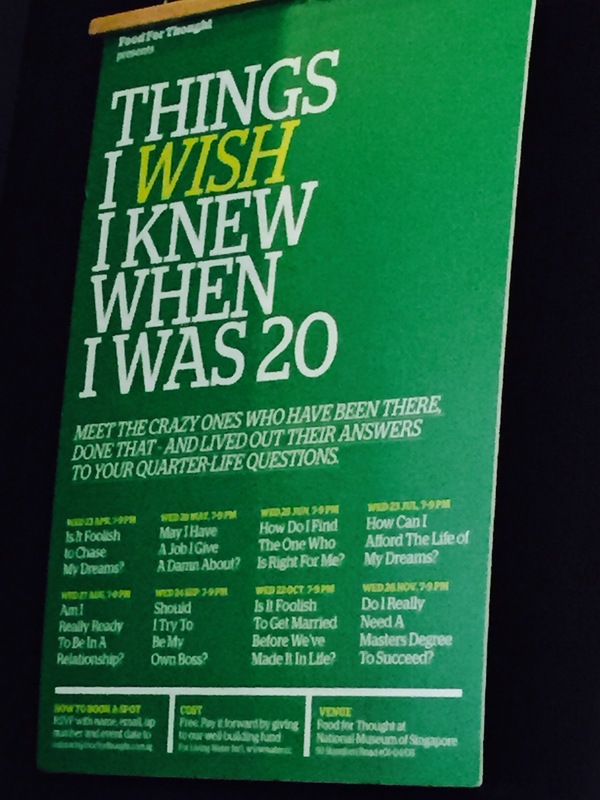 Food for Thought has put together a series of seminars called “Things I Wish I Knew When I Was 20”. // Is it foolish to chase my dreams? // May I have a job I give a damn about? // How can I afford the life of my dreams? // Should I try to be my own boss? // Do I really need a masters degree to succeed? What great questions! And how well framed! Even though I’m no longer in my twenties, they had my attention! This would be a great series of seminars to put up at your local church to equip your young people for the marketplace. Wouldn’t it be great for experienced mentors to share their experiences with you in those areas? What other questions should we ask? What other ways can you think of to engage your people in marketplace ministry?